Yes, why it has not become a scheduler, you can almost answer that from the name Desktop Calendar Tray OK! 1.) ... For what this Tray Calendar Tool? 2.) ... DPI bug fix and date in the middle of Calender! 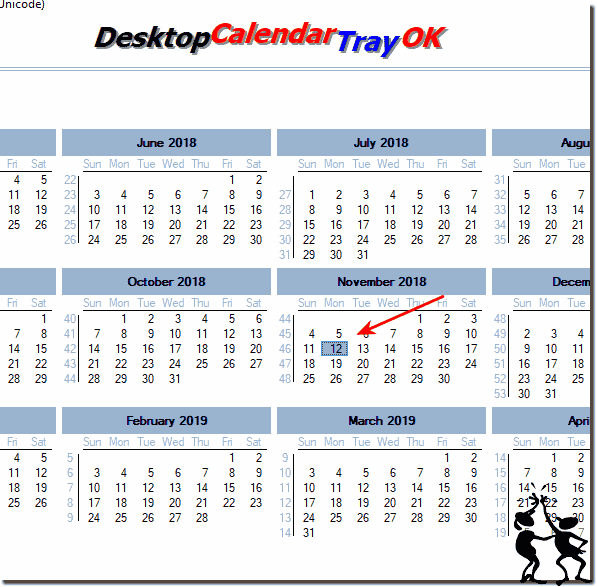 If possible, always use ... the new version of Desktop.Calendar.Tray.OK! 1.) For what this Tray Calendar Tool? As mentioned many users are dissatisfied with the complex calendar programs and asked me if I can write a simple calendar, which has exactly these helpful calendar functions and is incidentally very small. Sure you can accomplish this little helpful calendar orientation feature with other program, but what if it's all about these nice features. Inexperienced users are happy with such a small desktop calendar tool and are not overwhelmed and it does exactly what it should and not more and not less! You can test this Windows calendar, because no installation is necessary, you can also delete it quickly! (Image-1) Eg: In how many days is New Year's Eve! 2.) DPI Bug-Fix and date were in the middle! On my system I have it set for high DPI because it's a 27" screen with a 2560 x 1600 resolution and the bottom of your app is cut off, I can't see the date and time and it also has on the bottom right "... Please mark a da" so the y is cut off. Also, I was wondering if there was the possibility to chose the starting month x amount of days in advance. For me, I only need the calendar to see days prior to today and never in the future so it would be great if today's date were in the middle so to speak. (Image-2) Desktop Calendar in Windows Tray and Today OK! Desktop.Calendar.Tray.OK - FAQ-4: Why is not an organizer integrated (to allow event scheduling and notifications)?